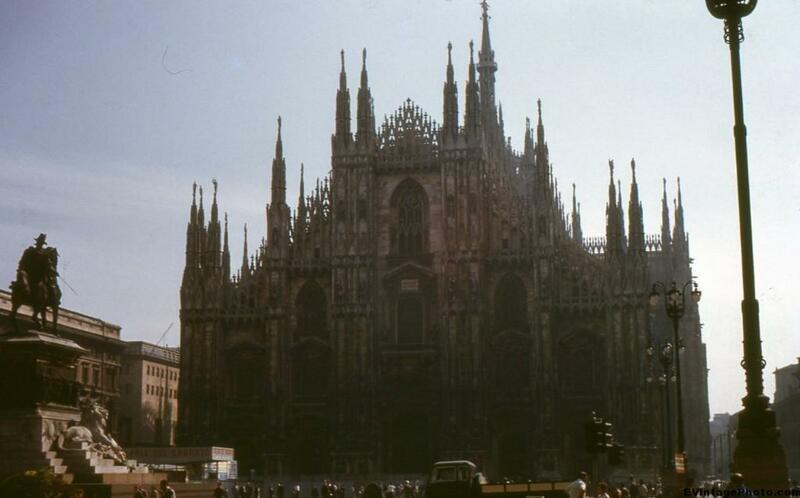 Today’s picture if of the Milan Cathedral in Milan Italy taken sometime in the late 50’s, early 60’s. The exact date is hard to pin down but based on the rest of the slide collection I am guessing it was 1960. It is dedicated to Santa Maria Nascente, and is the fifth largest cathedral in the world. Archbishop Antonio da Saluzzo ordered construction to start in 1386 with the sponsorship of his cousin, the Duke of Milan, Gian Galleazzo Visconti. When the Duke died in 1402, construction on the half completed cathedral came to a halt. Various parts of the cathedral were added over the years, notably Napoleon Bonaparte ordered the façade to be finished so that he could be crowned King of Italy there. With inauguration of the last gate on January 6, 1965, just a few years after this photo of the Milan Cathedral was taken, the cathedral was finally considered “finished.” Construction of this amazing piece of architecture took just 579 years. One of the things to note is that since this picture was taken the Milan Cathedral has been well taken care of. The dull grey color of the stone of the building in this picture shows evidence of the centuries of pollution Italy has endured.